Practical Concerns: A Better Way To Talk About Hockey? Do those statements have the same meaning? The answer depends entirely on what you mean by meaning. Following the suggestion of my friend Arik Parnass, I’ve began re-reading the book Thinking Fast And Slow, which explores many ideas that can be applied to hockey. One of the chapters in the book deals with the concept of framing – how people can be influenced to think about a certain situation depending on the words used to describe it. Going back to our initial example, did the Penguins win the Stanley Cup (because of their superior tactics, teamwork and talent level)? Or did the Sharks lose the Stanley Cup (because of their reliance on defensemen who are slow and can’t make a pass)? There is no right or wrong answer, but we can see how a simple difference in phrasing can lead us down different avenues. By any predictive metric, the Pittsburgh Penguins have generated a staggering amount of offense against the San Jose Sharks in the Stanley Cup Finals. Earlier this week, we looked at how the Penguins are able to create possessions with good defensive habits in the neutral zone. Today, we’ll examine how they create a volume of offensive chances via positional switches. The line of thinking lends itself well to the speed and teamwork-oriented nature of hockey as well. While the Penguins are by no means the first team to apply these ideas, they are a good example of how they can be used effectively at the highest level of the game. Here are some clips from Game 3 and Game 5 of the Stanley Cup Final illustrating the tactical benefits of fluidity and positional switches. In the playoffs, details make the difference. Heading into Game 4 of the Stanley Cup Final, the Pittsburgh Penguin have had the measure of the San Jose Sharks in terms of shot differential. Looking at the game tape, we can see that one of the contributing factors is the way both teams defend the rush. As a group, the Pens’ defensive corps is fleet-footed and blessed with good offensive acumen. 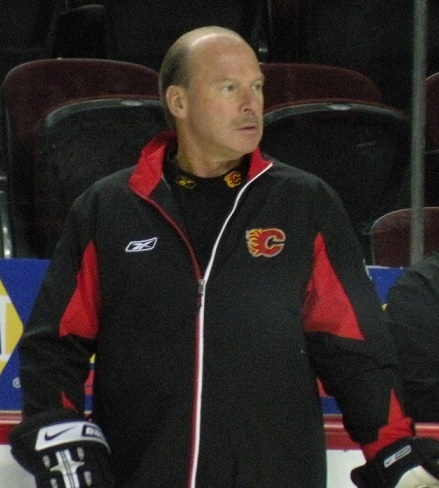 They are also undersized and prone to being muscled off the puck by San Jose’s skilled forwards. 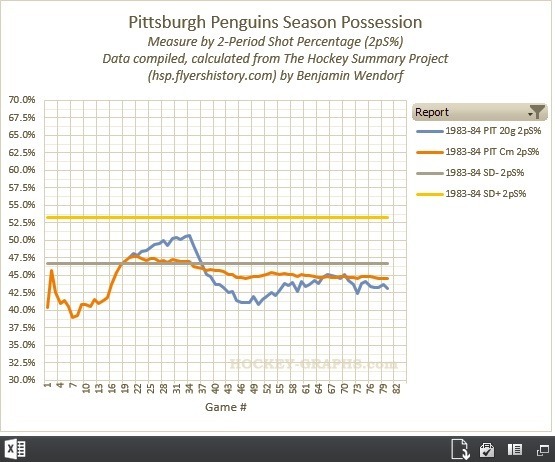 In order to minimize their exposure to defensive-zone breakdowns and to maximize the team’s speed and skill, the Penguins have been playing a very tight gap across the neutral zone, funneling San Jose puck carriers toward the end boards and standing up at the red line in order to encourage the Sharks to dump the puck in. A hallmark of the Mike Sullivan-coached Penguins is the team’s attacking mindset on and off the puck, as evidenced by the way they suppress the San Jose transition game. Something I set time aside for during the off-season is reading non-hockey books in an attempt to gain a better perspective on hockey. The work of Michael Lewis (Liar’s Poker, The Big Short, Boomrang) and Nassim Taleb (The Black Swan, Fooled By Randomness) were of particular inspiration. Below are some assorted thoughts based on recent readings and events. Tweet me (@ML_Han) if you’d like to disagree and tell me why. Eventually I hope to spend some time talking about this or a tangential at the second edition of RITHAC this September. 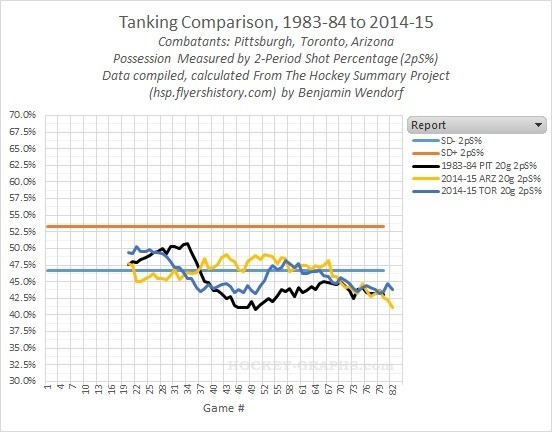 Having just added the 2014-15 season to our historical comparison charts, now was a good time to revisit (as I promised in my posts here and here on Pittsburgh’s 1983-84 tank battle) this season’s battle between Arizona, Toronto, Edmonton, and Buffalo. 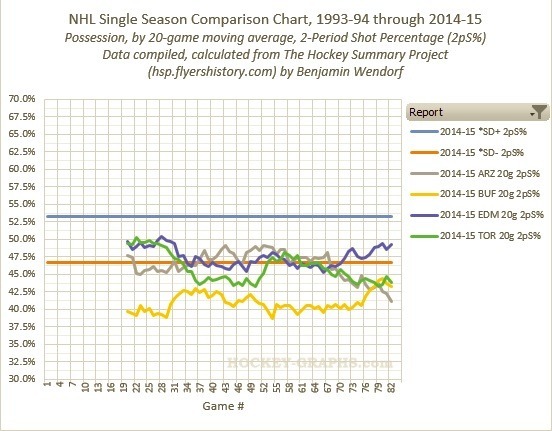 To do this, I tracked the progression of each teams shots-for percentage across two periods (or 2pS%), a possession proxy I developed for historical data that can help us compare teams back to 1952. As you can see above, the perception of the tank battle among these four teams wasn’t quite accurate to their results; Edmonton and Buffalo did not seem to have a marked drop-off in the final quarter-season. Arizona and Toronto, on the other hand, did noticeably drop, and in Arizona’s case to a level below the hapless Sabres. Ultimately, the fight was more to maintain their improved odds, because Buffalo managed to hold at rock bottom. As I asked when I wrote about the topic with Pittsburgh in mind, it still gives rise to an interesting question: is it more wrong to tank than to maintain a low level all year? In some cases, a team that’s already laid low doesn’t need to tank deliberately…but on the flip side, I suppose that team also assumes risk in losing support and fans by not appearing competitive all season. While Pittsburgh had probably the starkest, earliest drop-off, both Arizona and Toronto were able to reach the same kinds of lows by the end of the season. To their credit, while the Coyotes and Leafs were, at best, in the lower half of the league in possession, they certainly did their best in the race to the bottom. You could question the wisdom of this kind of thing, since Pittsburgh was guaranteed the top pick if they reached the cellar, while this year’s tanks were struggling for a higher probability.